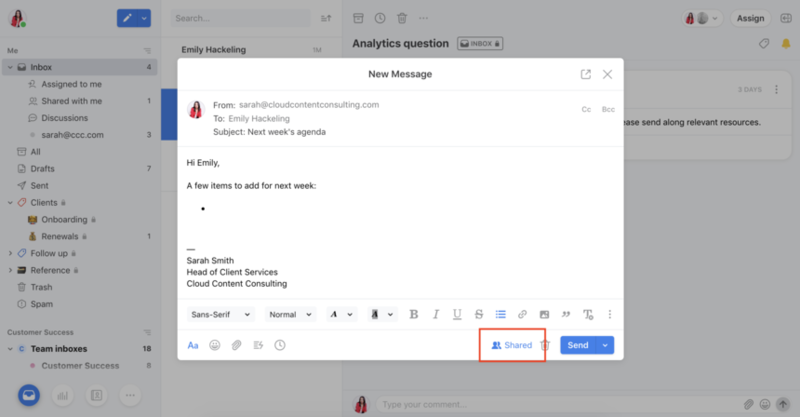 Sharing drafts in Front allows teammates to collaborate and get feedback on a message prior to sending. Instead of writing a draft on your own or needing to forward a copy of the draft for feedback, shared drafts enable you to edit a draft together and consolidate feedback in a clean, collaborative way. 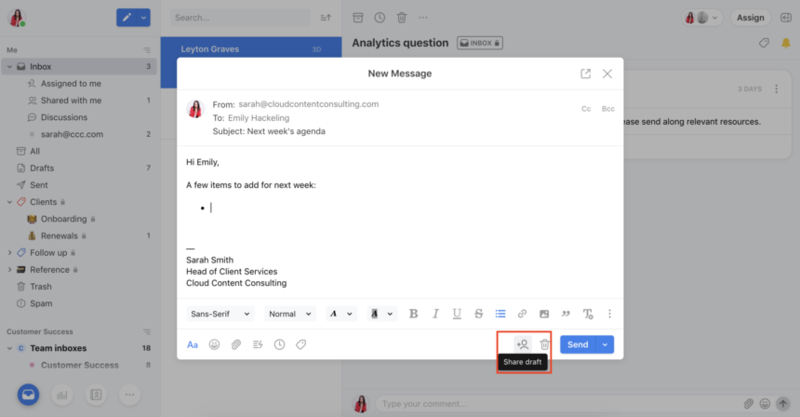 Compose a new message by clicking the blue pencil icon in the top left of your Front dashboard. As soon as you start composing a draft, it's only visible by you. Share the draft by clicking the person icon in the bottom right of the composer. Anyone you invite will see the draft in their inbox to give you feedback or jump in to edit. Select a suggestion or type in a teammate name to invite them to the draft. Click Invite. Once you click Invite, any teammates you've invited will see the draft message in the Shared with me section of their inbox to comment on or edit it. You can see that the draft is shared because the icon will change to say "Shared", and there will be a blue bar at the top of draft in your inbox. 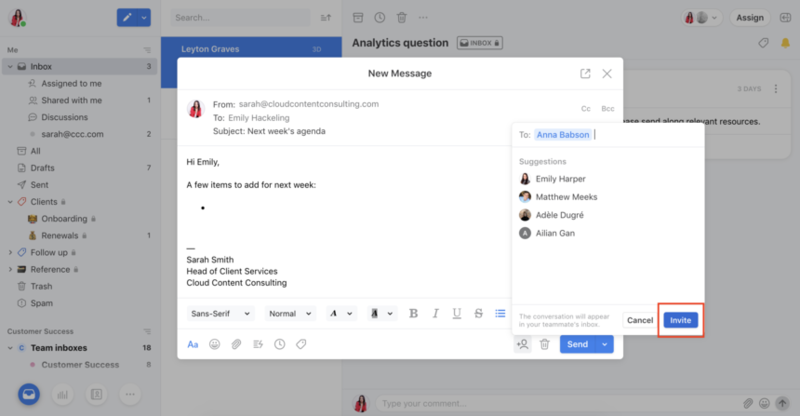 Create a reply to the existing conversation and type up your draft. Share the draft by clicking the person icon in the bottom right. Confirm you want to share the draft by clicking Share. Now, your draft is visible to all conversation participants. 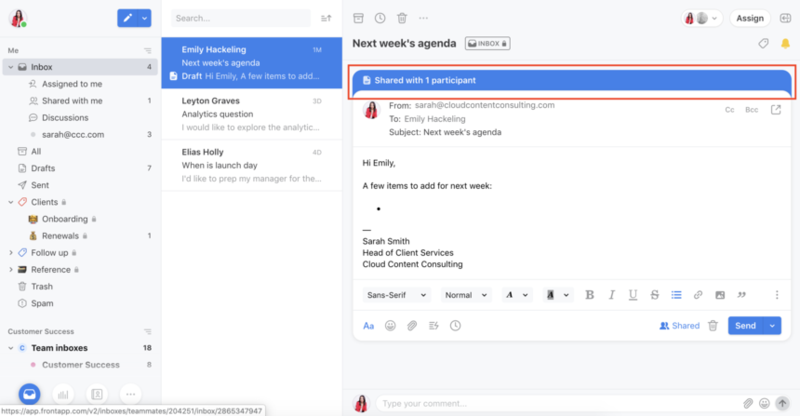 If it's a team inbox conversation, shared drafts are visible to everyone with access to that team inbox. If there are no other participants in the conversation yet to provide feedback on your shared draft, you can always @mention a teammate to loop them in. When a teammate is editing a shared draft, its blue border will show who is editing and when they last made changes to the draft. To take over the draft, click the Edit button at the top right of the blue shared draft bar. You will see a confirmation screen about whether you want to proceed with editing the draft. Only one teammate can edit a draft at a time. Make your edits to the draft, and your teammates will be able to see the edits in real-time on their screens. To pass the draft back, simply @mention your teammate and let them know you're done editing in the comments. Note: Any teammate can take over your draft by following the steps above, and Front will show you a warning if that happens to let you know you are not editing the latest version. Who can see the draft? Once you share the draft, it is visible to anyone who has access to the inbox you are sending from. Additionally, whomever you explicitly invite to the draft or are already participants in the conversation will see the draft. How do signatures work with drafts? When working on a draft, the conversation automatically switches to the signature of the person who is currently editing the draft. This allows for another person to send an email to someone even if they did not originally compose the message. You can find drafts you started in your Drafts folder. If you are shared on a teammate’s draft, you will see it in the Shared with me section of your inbox. Once you make edits to a shared draft, it can also be found in your Drafts folder. OK... But it's a unfinished feature as is... and an unfinished article! So this feature seems useless to me. 1st) The tutorial : ok, I share it... and then??? where does it appear to my team? Do they get notified that there is a draft on which I need comments? It is not told in the tutorial, neither anywhere else... so now, I am not at the office, I have to send a mail to tell my team to look into somewhere to find my share draft... duh? 2nd) The feature itself : are you REALLY saying that ALL of my team is going to see my shared draft? So this a kibbutz feature. We are ALL on the same level, and we share everything all together... But hell no! As the CEO, I want to share private stuff to my assistant and not to share it with my consultants/developers/support! The conversation system is great on emails, assignments also, but this 'shared drafts' is promising but truly disappointing. I won't use it until it gets right... Result : I will send my draft in an email, like I did 20 years ago. Front is great though and changed the way I interact via email, but some functionalities still need some improvement (like this one or Sequences). But you're on the right path. Jerome Chouraqui Thanks for sharing your feedback regarding shared drafts. Let me clarify a few points for you. 1. Once you share a draft from a team channel, you will also want to @mention the teammate that you want to see this draft. If you don't @mention your teammate, they will only see the draft if they happen to come across the email. They will not receive a notification about it. 2. If you share a draft from your individual channel, no one will see it unless you @mention them on it, or if you've given them access to your inbox, they can come across it as well. As a CEO, you can share your draft, and then @mention your assistant so that they can access it. We agree there could be improvements here. I will share these comments with our product team. Thank you very much. Cori Morris OK. I get it. The documentation here is somehow unclear (to me). I finally managed to do it with my colleague... but when she modified it... I just couldn't modify it myself as she was the only one to have right to modify or send it! Do you know how I can get back control? Jerome Chouraqui No problem. Yes, if you click the three dots in the top right corner of the draft, you should be able to take the draft back over. Cori Morris I will again complain over this feature. When you share a draft, you can comment it and the person who is targeted will be able to edit the draft... ok. That cool. But a fantastic splash screen tells the new writer that the sender WILL NOT BE ABLE TO EDIT IT LATER... and that's TRUE!!! WTF??!! Apologies for the confusion here. The warning is misleading. However, what it means is that they will not be able to modify it while you are editing it, but they can take it back to edit it a second, or even a third time. Cori Morris Hi... I am sorry... I don't see how to share back the draft. I looked everywhere. I don't find it. Please help. Jerome Chouraqui Sorry if we weren't explicit enough here. So, there is no specific button to "give the draft back". Once a draft is in shared stated it means that both the person sharing it and the one that it is being shared to can access it. The process relies heavily on the commenting function. Once you are done editing your draft the person who originally shared it should see your updated version. They can then go into the 3 dots (top right corner of the message) and there you will see the option edit draft. You can then add your own changes and notify the team member you are working with to have a look. The changes will populate in real time and the team member can then do the same. That way you can have a constant loop of improvements to one drat (share draft > edit by team member > comment > edit draft > comment etc.) I understand that this process may not be very clear at present so thank you for your feedback on that.